On Receiving a Fulbright – School. Culture. Community Engagement. A year ago I applied for the Fulbright Distinguished Award in Teaching. It felt like a long shot. Out loud, I talked about the application process as a practice in writing down my often random, but impassioned thoughts on paper. In my head, I immediately began daydreaming about living abroad, nerding out with other educators and joining the football fandom in Europe. It was fun to live in the process and daydream about the possibilities. With all the support one could hope for from my loving partner, I squeezed out responses to application questions over the course of a few weeks. (side note: It is pretty spectacular having a professional writer and dramaturg as your partner during any application process) I felt proud of my finished application, particularly my decision to not hold back on my beliefs about the on-going injustice in our country and the impact this continues to have on public education and more specifically, on the communities I have worked with. You never know how calling out White Supremacy will sit with application reviewers 🙂 My shoot for the moon approach seemed to pay off. The time to focus on my ideas and curiosities about the past 10 years working in elementary schools (more on these ideas to come and in the About page). “The Having of Wonderful Ideas” as Eleanor Duckworth preaches, is something U.S. teachers (and students) rarely have time for! Moreover, I get to be a part of a cohort of educators, tasked with this as the expressed purpose. Such a gift! Stepping outside the context of the U.S.! a.k.a getting the hell out of the country. What a privilege, particularly in the current political climate, to have the opportunity to leave, step back, and gain a new perspective on my work and life in general! 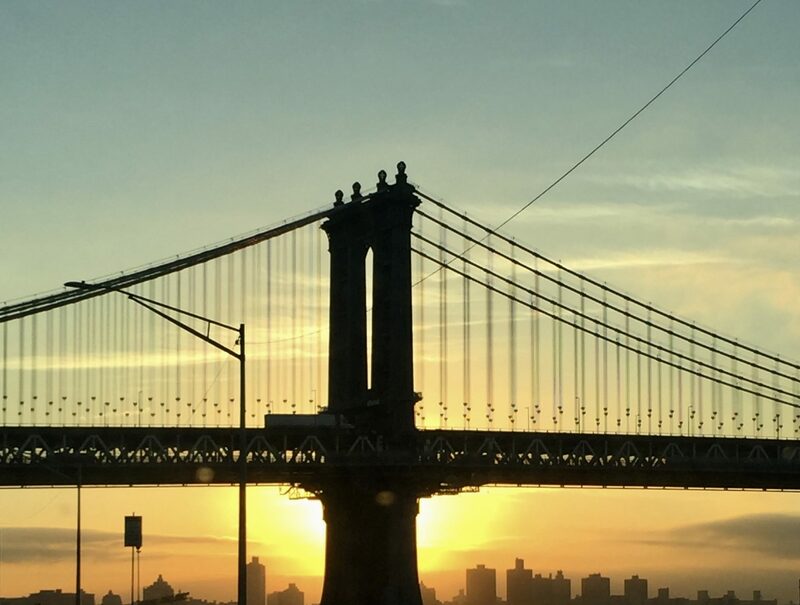 Not having to wake up at 6:00 a.m., eating granola half asleep while driving across the Brooklyn Bridge, using my knees to steer and shift (and sometimes taking pictures – see header photo :). I am looking forward to continued granola eating, just not so early. Scottish Football! Shout out to the big brother, Marquan, for already blessing my wife and I with tickets to Celtics versus Hibs at the end of January! I plan to use this blog to highlight the journey while also building out content for my Fulbright inquiry project (see About page). As I push myself to further develop a practice of writing, I am also excited to post photographs as I learn more about this medium with my new camera. Thank you to all the friends and family that encouraged this journey, to all the family that let us crash with them during the in between time and to those that hopefully stay in touch while we are there! Wishing you lots of luck on this journey Reed! Thanks, Mei! Hope all is well with you! Suerte Reedito. I’m excited to follow along. You’ll have much to share with them, and have even greater abilities to effect change here when you come home. I expect that you will tell your new soccer mates that you’re a pure #9 striker, no compromise. Learn, share, score goals, and have a great time. Many thanks for the kind words, Matt! Miss our runs together! You are right, I am planning on defining myself as a striking force that plays little to no defense. We will see how it goes! Wishing you all the best. You are an amazing educator and have no doubt that one day would will take Bestsy’job. Such kind words, Griselda! Thanks! So excited for you both and can’t wait to read about your project!!! Safe travels! Woo-hoo!!! Can’t wait to follow along on your journey here, dude. So exciting.